We'd love to see you at our Philipse Manor Eagle Informational Meeting! Please join us for a neighborhood update on the Grand Central cast iron eagle of Philipse Manor, Sleepy Hollow. Watch a brief presentation highlighting the eagle's rich history, the Save the Eagle Committee's current efforts, and the restoration campaign we plant to undertake this summer. 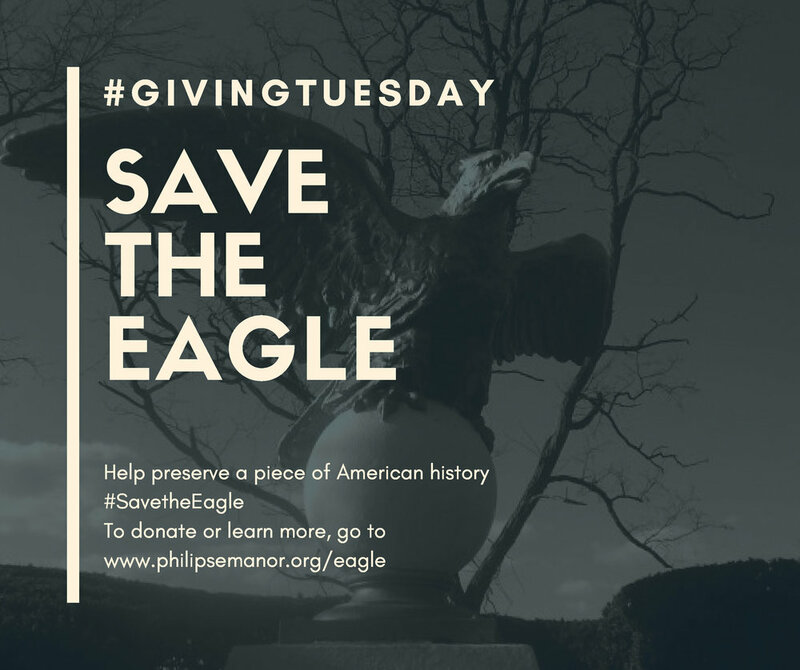 Hear from the chair of the Save the Eagle Committee, the chief conservator on the project, and the president of the Philipse Manor Improvement Association. Please RSVP here. Happy Giving Tuesday! Today we'd like to make a special request of our community. A conservation assessment has determined that the Philipse Manor eagle is in bad need of restoration. We are raising the funds necessary to restore and preserve the Eagle. The Eagle left its perch on Grand Central Station in 1910, and has graced our train station for over 100 years. We would like to preserve this impressive piece of our local history for generations to come. Please help us this Giving Tuesday to #SavetheEagle. For more information, please visit our eagle page, www.philipsemanor.org/eagle which has details about donating to this important project, the current state of the eagle, and our restoration goals. Our first Manor-wide Tag Sale! What's old can be new again at the Philipse Manor Tag Sale! Over 30 homes are participating. Follow the YELLOW signs along Rte 9/North Broadway - the neighborhood is located directly across the street from the very large Sleepy Hollow Cemetery (and Old Dutch Church). 2018 Membership stickers are in the mail! Welcome letters and Membership stickers for 2018 have been mailed out this week. These new green stickers will be valid starting April 1st through April 1, 2019. The orange 2017 stickers will be considered expired as of April 1st. Haven't renewed yet? It's not too late! Membership applications are accepted throughout Spring. Simply go to "Get Involved", then click on "Become a Member" for our online and paper application instructions. Membership dues are $80 for Families, and $55 for Seniors over 65 years of age. Come meet your Village Trustees at Candidate's Night! The PMIA and SHMA cordially invite you to the annual Sleepy Hollow Candidates Night. Come meet your Village Trustees! Candidates Night is an informational give and take between candidates and our Association members. Bring your questions and meet your neighbors! Hudson River Barges: Make your opinion known! At last night's annual meeting the topic of the Hudson River Barges, and the proposal being put forth by the Coast Guard was discussed. Tuesday, December 6, is the deadline for providing comments to the Coast Guard. The August 10th Informational Meeting hosted by Village Trustee Rachelle Gebler consisted mostly of suggestions from the community concerning the use and amenities for the East Parcel. Suggestions were taken from the audience, for example, inclusion of a fountain, sprinkler area for children, covered parking, alternate access from Devries Avenue, etc. There was a lot of enthusiasm for roadways through Philipse Manor to alleviate congestion in the village. Although this was not a public hearing, three formal public hearings where statements and concerns will go on record are planned for August 23rd, September 12th, and September 20th. See posting below for more info. We strongly encourage all Manor Residents to attend or send all concerns to the Town Clerk. The draft concept depicting the separate spaces is attached for your review. Public hearings have been scheduled for commentary on the East Parcel Development. During the community discussion held on August 10th many ideas and suggestions were raised for how the space might be developed to best fit the needs of the Sleepy Hollow Community. Many of the ideas would be great enhancements to the outdoor space in Sleepy Hollow, and some of the suggestions would have a direct impact on the Philipse Manor community. One such suggestion was that Philipse Manor be considered for egress from the East Parcel. The suggested route was through Devries Park and onto Devries Avenue. If you have any concerns about this proposal, and how it may impact our community, I urge you to let your concerns be known during the upcoming public hearings. If you speak at the hearing or put your comments in writing to Paula McCarthy Tompkins (Village Clerk), they will go on record and must be addressed. The dates for the three public hearings are: August 23, September 12, and September 20, 2016. The hearings are to be held at Village Hall at 7:00PM. I cannot emphasize enough the importance of your comments and letters. The Engineer's Concept Plan can be found here. I encourage you to review the plan and to make suggestions or raise your concerns, either directly to the village or by contacting the PMIA through the website or reach out to me directly at my email (cathy.golub [at] verizon.net) with your concerns. I plan to present at one of the hearings on behalf of PMIA. Please mark your calendar for the August 10th meeting about the East Parcel Redevelopment project! The meeting will take place at 7pm at the James F. Galagno Senior Center at 55 Elm Street. The meeting will be a great opportunity to learn more about some of the plans for the space that abuts our neighborhood, as well to voice any concerns or preferences you have for how the space is used. You are invited to two informal meetings to discuss the East Parcel Redevelopment. The East Parcel is a 28 acre portion of the old GM site located on the east side of the Metro North Railroad tracks and south of Devries park. These gatherings represent an opportunity to discuss the creation of a new center for community activity including areas for recreation, arts and culture as well as a modern Public Works facility to replace the current facility. Village website's home page, has been created to start our discussion and now we have the exciting job of deciding exactly how to mold that to the needs of our community. Meeting dates are July 27 and August 10 at 7:00 p.m. and will take place at the James F. Galgano Senior Center at 55 Elm St.
July 4th Fireworks in Tarrytown! Fireworks for Tarrytown/Sleepy Hollow will be held at Pierson Park on Monday, July 4th, down near the Tarrytown train station. The band Super Hero kicks off the evening at 7pm with a live performance. Fireworks will begin at 9pm. Can't make it to Pierson? Head over to Kingsland Point park to watch the firework show! We received notice from the Garden Club recently that there was a house break-in in Philipse Manor on Thursday 1/28. A house on Millard was robbed of jewelry and other small items around 7:30. All took place within 15 minutes. A neighbor witnessed a two men in a black car idling outside the house, for at least a half hour around the time of the incident. Fortunately, no one was home or injured, but many items, including precious family jewelry pieces were taken. Please notify your neighbors and other members, and continue to be diligent about keeping our community safe. Remember to lock your doors and use security systems whenever possible. As you know, the MetroNorth track construction project is ongoing. Some folks have reported that the construction is causing issues in our parking lot. Spots are being utilized by construction equipment and workers vehicles, making it difficult to park. Construction workers are not supposed to park in or block the West Side Lot. Please know that we are aware of the issue and will continue to raise it with the construction workers. In the meantime, please allow yourself some extra time in case the lot is blocked by any MetroNorth construction equipment and feel free to continue to notify us of any issues or problems.